During our time living in India we became really big fans of Indian food. One of the greatest parts of traveling there was tasting all the different types of food around the country. In India this is normally made with potatoes, but we have substituted them for sweet potatoes in this dish for the extra nutrition. Heat 1 Tbsp of coconut oil in a large frying pan over a high heat. Add the asafoetida, cumin seeds, ginger, chilli and turmeric. Mix and fry for a few seconds. Add cauliflower, sweet potato, water, and salt, cover and cook on a medium high heat until the water is evaporated. This will take about 10 minutes. Stir once in a while to avoid it catching on the bottom of the pan. Check that the sweet potatoes are cooked through. If they are not you may need to cook them for a little while longer, and add a little more water to create the steam to cook them in. Add the garam masala, coriander and mango powder. Mix and serve. 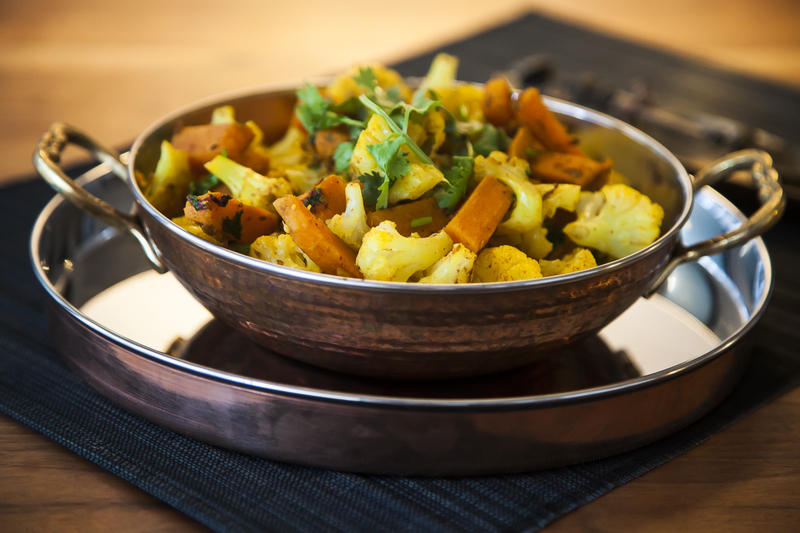 Can be served as a side dish with Chicken Cardamon Curry with Papaya or another curry dish.